I feel like someone could actually make these on their own quite simply! A bag of Ruffles, a bunch of melted chocolate and come bacon crushed up into little bits. Dip the chips into the melted chocolate halfway and stick them on a baking sheet covered with waxed or parchment paper. then sprinkle the crushed up bacon on top! Put the baking sheet in the refrigerator to set the chocolate and you’re done! Instant deliciousness. Probably cheaper, too. 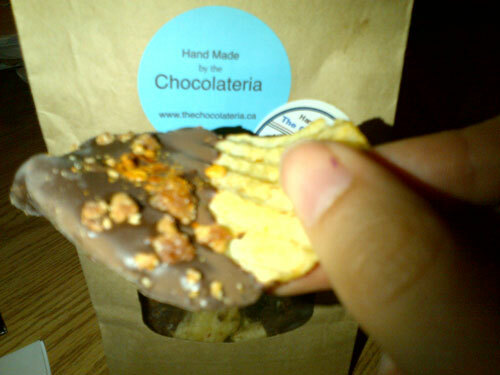 I’ve heard of people taking food they love and combining them in “unique” ways – stories of pregnant women combining pickles with watermelon, ninja turtles scooping ice cream onto their pizzas, etc – but I hadn’t tried a too outrageous amalgamation…until I was introduced to a thick ruffled potato chip that was coated in a rich chocolate and sprinkled with a healthy topping of mesquite bacon and red pepper flakes. Sure I’d had and made cupcakes topped with maple icing and bacon on top, but that was like a breakfast dessert, something that made sense in my mind (hint: I added Canadian-made Spice Box whiskey into the maple icing to add a nice vanilla flavour to the sauce). This chip was a different story. This chip was a colossal cacophony that worked wonderfully.